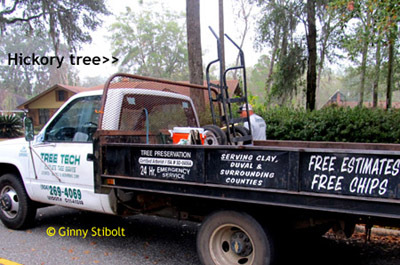 Tree trimmers were hired to remove a healthy hickory tree. I've gone through more than 20 loads of chips on our property over the years. A couple of years ago, my old wood chip pile had been in place for more than a year and what was left of it was mostly compost. So I was in need of some new chips. I followed a caravan of tree trimmer trucks including a chipper down my road my road. I asked the tree guys what they would be cutting down, thinking it would be some dead or dying trees, but no. They were going to remove a perfectly healthy hickory tree, because according to them, my neighbors thought it was dropping too many nuts on the lawn. Maybe there was another reason like its being too close to the bulkhead next to the lake, but whatever the reason, the tree guys would deliver the load of chips around lunchtime. The old chip pile had to be moved! I hurried home to get to work on distributing the last of the old chip pile. I changed into work clothes and hauled my large garden cart, large shovel, leather gloves, and iron rake out to chip pile at the far side of the front meadow. I also took out the cover for the removable fence post hole, so no chips would fall into it when the truck came. I removed the fence slats and the one fence post to open a 16-foot gap for the chip dump truck. The old chip pile was larger than I thought. I dumped the rest of the old chips on the pathway out to the chip pile and raked it smooth. It was another seven or eight loads. Whew! This pile wasn’t as small as I thought, but it was gone before the new load arrived. There is nothing like a deadline to move *things* forward. While I was working on deleting the old pile, the birds were flitting and chirping all around me. I thought about all the wildlife habitat that this tree had provided. Being near the lake, its branches probably served as handy perching places for the ospreys, swallowtail kites, kingfishers, herons and maybe even a bald eagle. Hickory nuts feed many types of wildlife. Hickory trees provide good habitat and a food source for wildlife. There were probably nests of many types of birds and squirrels over the years. 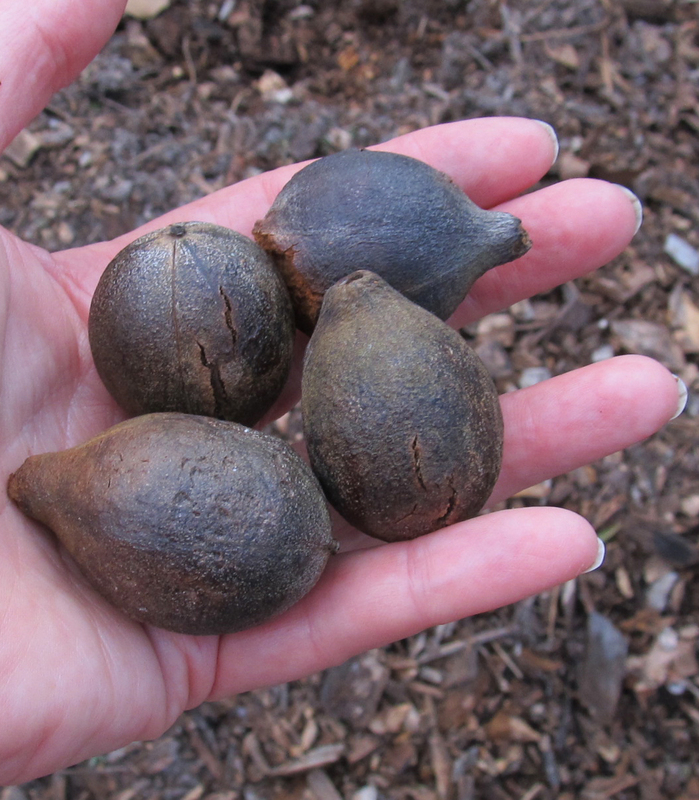 The nuts, which littered the lawn, fed many generations of squirrels and other small animals. Hickory serves as the larval food for the royal hickory moth and others. Plus this tree was draped with Spanish moss, which songbirds use for nest building. Warblers and bats often make their nests right in the moss itself. Many reptiles and amphibians hide inside the thick masses and so do various types of insects and other small critters, all of which in turn support the birds, and so on. We are fortunate in our neighborhood to have many mature trees–most of them support beautiful festoons of Spanish moss. But our trees are mostly oaks, pines, sweet gums, and maples. We don’t have many hickory trees in the neighborhood, so this tree was important for the overall diversity. While I was happy to have new chips, I mourned the loss of the hickory tree and the habitat values it offered. Mulching newly planted trees and shrubs with arborist woodchips is probably the most sustainable way to reduce the ongoing maintenance, because despite what you may have been promised, a native landscape in an urban/suburban environment is not maintenance-free. To create the best habitat, plant native trees and shrubs in a grouping or grove that mimics a natural setting with enough distance between the plants to allow for mature tree sizes, but close enough so that they create a connected canopy, intertwined root systems, and a dense undergrowth. Initially, this means that there are wide spaces between these small woody plants. As they grow, the leaf drop and the shade will make the area between the plants less hospitable to weed growth, but until that time, arborist woodchips create the needed coverage. · helps hold in the moisture*. · reduces the germination of weed seeds both physically by smothering them and chemically, when freshly applied, because the decomposers deplete the nitrogen supply at the soil surface. · eventually becomes part of the soil and enriches the whole area. 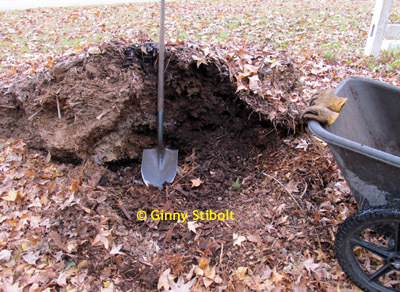 The resulting rich soil stimulates the roots to spread outward for healthier and more wind-tolerant trees. But the woodchips should not be piled against tree trunks or shrub stems. 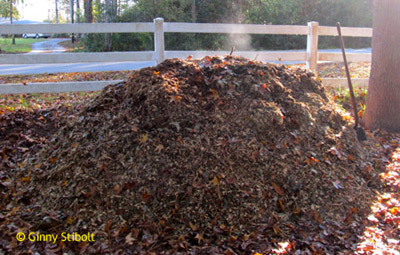 The ideal thickness of the mulch cover varies depending on where it’s used. For a path, use five or six inches, which may last for two years or so before needing more chips. For killing an existing patch of vegetation use eight or nine inches. Some people lay down cardboard or paper first. This method only works for “normal” weeds; those with deep roots or persistent rhizomes will grow right through the mulch and the cardboard. For mulching between existing plantings, such as that grove described above, use three or four inches when the plantings are fresh, but reduce the thickness over the years until the grove’s own leaf fall provides enough cover. Two days after delivery, the chip pile is steaming in the morning sun. Since the leaves and Spanish moss were part of the load, there are both “green” and “brown” elements present. Of all the loads of arborists chips we've had, some were relatively small like this one, while others were twice as large. All these loads have worked themselves into our soil and the felled trees have provided new life as they have decayed into soil one way or another on our 1.5-acre property. Our mostly native landscape has benefited. Also see my post on arborist woodchips: Follow the Yellow Mulch Road.